Place a prestige cooker and add chopped chukka kura along with washed turdaal,green chillie slits and tomatoe slits. Add a seasoning made with oil,mustard seeds1/2 tsp,methi seeds a pinch,red chillie slits,hing or ginger garlic paste, add the seasoning to the cooker ,add water and pressure cook ,this mixture for 4 whistles. After removing the lid when it is cool,mix well,then add table salt. 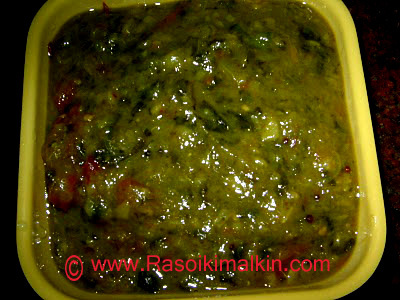 Serve in a serving bowl.Very tasty and healthy with rice and rotis. This is a favourite dish in my home,my husband simply likes it.